Our Christina Tynan-Wood did a great story on all the practical stuff you NEED for the eclipse on Monday. But what about the stuff you really WANT? I mean, the total solar eclipse going down on August. 21 is kind of a big deal. 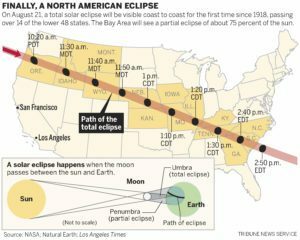 For the first time in 99 years, the moon’s shadow will make its way across the entire United States from the west coast to the east. If you live in these states on the map to the left here, it’s going to pass right over the top of your head. And that’s a big freaking deal. Such a big deal, this one event links Hindu mythology, the world’s first computer, and Albert Einstein. So obviously, you’ll need a memento or two to mark the occasion, right? If you’re like me and haven’t planned ahead at all, here’s how to get in on the action. Or at least some of those once-in-a-lifetime souvenirs! Experience your own total solar eclipse every single morning for the rest of your life. Or at least until you break it. The ThinkGeek Solar Eclipse Heat Change Mug is a whole lotta awesome: When the mug’s cold, you see Sun’s corona in black and white on one side and in color on the other. But the minute you pour in some coffee, tea, or whatever else you might drink hot, the eclipse happens, revealing a full Moon and turbulent Sun! Behold! You could say the difference is like night and day. 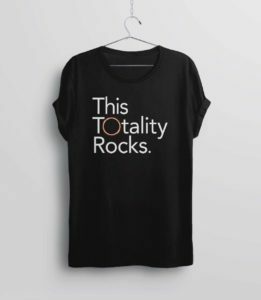 “This Totality Rocks” Solar Eclipse 2017 Shirt comes in both men’s, women’s, and kids sizes straight from Easy. It’s 100% cotton, so go one size up. Remember this once in a lifetime event with a cute saying that glows in the dark: the “Something Between Us Glow-In-The-Dark T-Shirt.” It gets charged when the sun shines on it, then glows when the sun goes down. Hopefully like you and your special someone will on Monday. What do you get when you cross the sun and the moon? 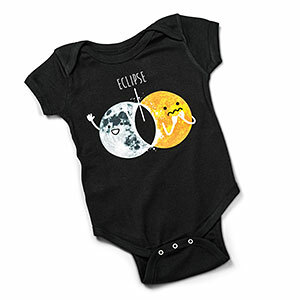 This adorable, baby Solar Eclipse Bodysuit! Deck out baby in this super cute black onesie. With a 3-snap closure and lap shoulders, this bodysuit is easy on/easy off, and you’re all set for quick diaper changes. Better hurry. The eclipse is almost upon us! We humans are hardwired to pay attention to things that are easy to understand, out of the ordinary, or totally freaking cute. These plushies are all three. 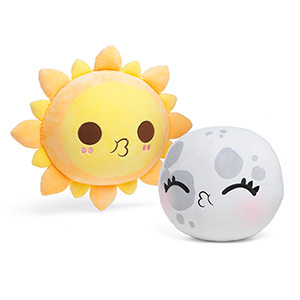 The Total Solar Eclipse Sun & Moon Plush are simply adorable, perfect for a child or kid-at-heart. More than just simple toys, they also serve as useful tools for illustrating a complex topic – a total solar eclipse. But let’s be real. We’re just going to cuddle with them. This sweet ring is another great way to commemorate the big day. 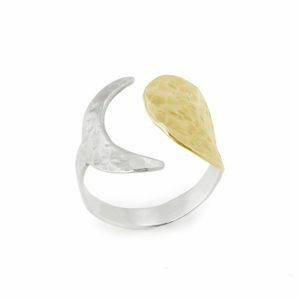 It’s called “The Sun and Moon Wrap Ring,” and comes from Uncommon Goods. Its hand-hammered texture and mixed metal sun and crescent moon invites light and shadow to play across its surface. Made from Sterling silver and 14kt gold plate. 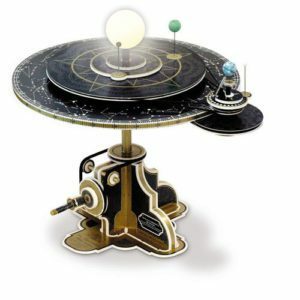 So, it’s a small cardboard toy-ish gadget that, when you turn the handle, spins around and illustrates the change of seasons as well as the change of the moon and its’ eclipse. You had me at LED light on top. Just so cool. 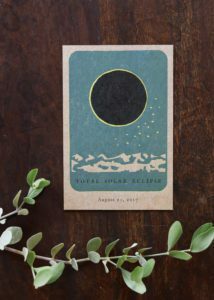 While the solar system goes big, you can go small, with this vintage looking letterpress postcard. It’s a perfect little memento to frame and keep for yourself or to send to a friend. 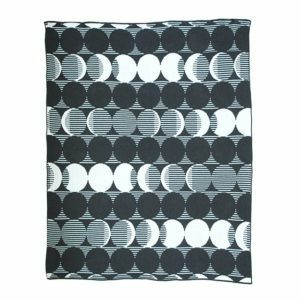 “Remember that time we cuddled upon and watched the solar eclipse together…” That’s what you’ll say every single time you wrap yourself (and your honey) in this cozy throw from Uncommon Goods. While it’s keeping you cozy, it even helps reduce waste by using recycled cotton fiber, keeping textile trash out of landfills here on planet earth. It’s a sustainable snuggler and modern memory keeper — that will look at home on any couch. Yep, saved the best for last. In honor of the big day, Krispy Kreme’s original glazed doughnuts will be “eclipsed” by chocolate glaze to commemorate the total solar eclipse. Doughnut lovers will be able to get their hands on the extremely limited treat all day on Monday, Aug. 21, as well as during evening “Hot Light” hours on Aug. 19 and Aug. 20. Have you seen any other crazy, awesome, or crazy-awesome momentous to grab up for the big day? Be sure to let us know via social media or by sending us a comment! Also – be sure to share your Eclipse photos and videos across our social media as well! Happy Eclipsing!